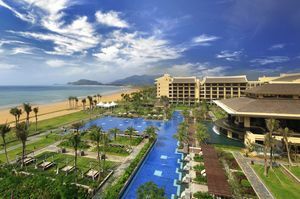 While developers such as Starwood Hotels & Resorts Worldwide and InterContinental Hotels Group have already moved into the up-scale luxury resort market that continues to grow on the Chinese island of Hainan, others are left waiting for their business desires. High end casino operators like Caesars Entertainment and MGM Resorts International who are looking to move in and take their game to another level by courting tourists whose numbers grow yearly will be disappointed with a recent declaration. The possibility of casinos opening on the resort island has been strongly dismissed by Mr. Wang Yong, the mayor of Sanya which is perhaps the best known destination city on the island with 14 high luxury hotels currently operating and more in the works. This sentiment was echoes by Mr. Luo Baoming, the Communist Party Chief of the island who was quoted as saying, "we cannot at all allow Hainan to operate casinos." Despite this, there are plenty of reasons to visit the area beyond the rest and relaxation offered at the variety of resorts including an active yachting community, rich historical sites, nature preserves, and new attractions being built such as Phoenix Island which is an artificial archipelago. The number of visitors travelling to Hainan continues to swell every year; growing from 20.6 million in 2008 to 25.87 million in 2010 and over 30 million in 2011, this denial of entry to casino operators leaves the area to miss out on gambling booms being experienced in other popular destinations such as nearby Macau, China. This neighbouring area has been reporting record earnings both in year over year and month to month comparisons at increasing rates. In just 2013, the area broke the 2012 record takings in both February and October and recently announced that the February record has been shattered yet again with the short month raking in 38 billion MOP (Macau Pataca) which translates to 4.75 billion US Dollars or 29.14 billion CNY (Chinese Yuan). While it would seem difficult to ignore those kinds of numbers when looking at a region's overall financial gains, it seems that casino operators and developers will not be dissuaded by this setback. Some, like Sheldon Adelson, Chairman and CEO of the Las Vegas Sands, look to broaden their horizons across Asia into other markets such as Japan which has bills to raise gambling laws up for debate. Others are willing to bide their time and wait for the attitude towards gambling in established resort locations to change, since the two businesses tend to go hand in hand more often than not.